The Temple of the Crystal Timekeeper: The Chronicles of the Stone, Book 3 is an action and adventure novel for children and young adults written by Fiona Ingram and illustrated by Lori Bentley. Adam, Justin and Kim knew they’d be questing for the third Stone of Power when Aunt Isabel made the arrangements for their travel documentation, but she and archaeologist James Kinnaird had wanted to keep their actual destination a surprise. The three kids were thrilled to discover that they’d be searching for a lost Mayan city buried deep within the Lacandon jungle. They had no idea, however, that the carefully planned expedition would take a sudden turn towards the unexpected when an afternoon’s flyover of the jungle with James piloting their leased plane ended in disaster. The Cessna had malfunctioned and crashed into a canopy of trees, leaving the three kids hanging upside down from their safety belts and James bleeding and unconscious. Their first priority was to get out of the wrecked plane, which was a matter of some urgency as the fumes that filled the cabin made them increasingly nervous. The trio did make it down to the jungle floor, with a bit of maneuvering, and they were considering how they would get James out of the plane when they realized that they were not alone. Adam couldn’t believe it -- here they were lost in the middle of a vast jungle, one filled with snakes, venomous insects and jaguars, which James had described as apex predators. Even more discomforting, however, were the distinctly humanoid eyes gazing at them from behind a large grove of bushes. Suddenly, tribesmen appeared, garbed in loincloths and adorned with tribal face paint, tattoos and scarring. They were carrying spears, which they didn’t hesitate to use to block Justin when he attempted to stop them from climbing up to where James was still lying in the wrecked plane. The three young teens wondered at the natives who seemed to be ignoring them as they worked to free James and then began to carry him off. Seeing no option other than to follow them, Kim, Adam and Justin decided they’d probably be better off going along with the natives rather than staying alone and without supplies in the jungle. At least, they hoped so. Fiona Ingram’s action and adventure novel for young adults and preteens drops the reader, along with Justin, Kim and Adam, right into the thick of the action, and I can’t think of a better place for a reader to find himself in. I’ve read the preceding books in this series and find myself more and more impressed with each subsequent volume. While you can read this one on its own, don’t do it. There’s an underlying thread that connects these books that shines out brilliantly as you follow the three adventurers as they meet each challenge and master it. Aunt Isabel and James Kinnaird are marvelous guides and mentors and, under their tutelage, each of the three young characters is seen as they face fears, develop new skills and learn how effective they can be as a team. I was thrilled to learn that this third quest would take place in the Lacandon jungle and that the team would be searching for a lost Mayan city, but I had no idea how detailed and informative this book would be. I especially enjoyed meeting the uncontacted tribe along with Adam, Kim and Justin, and seeing how they interacted with the three marooned kids. Ingram’s story educates as it entertains. That description might initially put off some prospective readers, but don’t let it. It’s not nearly as ominous as it sounds at first. Each of the books in this series is a learning experience involving interaction with different cultures, history and, yes, adventure -- lots of adventure! Following the tradition of classic adventure writers such as H. Rider Haggard, Jules Verne and Robert Louis Stevenson, Ingram makes the varied locales in which she sets her stories come alive so fully and vibrantly. Seeing her three young heroes grow as they learn, explore and solve the succession of challenges, setbacks and puzzles that come their way, in those far-flung locales, is a grand experience indeed. In The Temple of the Crystal Timekeeper, Adam, Justin and Kim find their own individual strengths, and they each come of age in unique and special ways. They complement each other so very well and are truly a team worth watching -- especially in this book where they are, for the most part, on their own. Ingram’s work also highlights the plight of the uncontacted tribes in this area of the world, where commercial and agricultural interests are destroying ages-old cultures and communities. Looking for a grand adventure series for a child or young adult? Do consider Ingram’s The Chronicles of the Stone series, but bear in mind that these books are grand and illuminating entertainment for adventurers of all ages, including those fortunate adults who still thirst for adventure and the thrill of the undiscovered. I’m so pleased that Ingram’s series revolves around seven Stones of Power and I’m looking forward to books 4 through 7. The Temple of the Crystal Timekeeper: The Chronicles of the Stone, Book 3 is most highly recommended. Heart stopping danger stalks four young people through the jungles of Mexico in the exciting adventure novel, The Temple of the Crystal Timekeeper (Book III - Chronicles of the Stone) by Fiona Ingram. Thirteen-year-old Justin and twelve-year-old Adam and Kim have been given a surprise trip to Mexico. Justin and Adam's Aunt Isabel, a well-known investigative journalist, and their archaeologist friend, James, are helping them on their quest to find and secure seven ancient stones. When they arrive, James won't tell them his plans and is having fun keeping the purpose of their expedition a secret. He has only told them that it is the greatest treasure hunt ever and hints that they are searching for a lost city. While Aunt Isabel stays in Mexico City to research, James rents a plane and takes Adam, Justin, and Kim on a reconnaissance flight over the Lacandon jungle. During their flight, disaster strikes and their plane crashes into the lush rainforest canopy below them. James is hurt and unconscious and they are many feet above the jungle floor. A small indigenous tribe helps them down and nurses James. Although James is immobile and insensible, Adam strongly feels the urge to continue hunting for the lost city. With the chief's grandson guiding them, Adam, Justin, and Kim traverse through the hazards of the jungle. Worse than the crocodiles they encounter, a madman who is impersonating the ancient Aztec god of darkness is stalking them, and their old archenemy, Dr. Khalid, is on their trail. Can James, Adam, Justin, and Kim survive the perils they are confronted with and make it back to civilization? Action, danger, and excitement are the key words for the riveting adventure novel, The Temple of the Crystal Timekeeper (Book III - Chronicles of the Stone) by Fiona Ingram. The story has an intriguing plot that is set in the Maya area of Mesoamerica, introducing inhabitants and civilizations whose ancestry dates back to the time before the Spaniards infiltrated the region. Its spellbinding storyline explores the history of the Aztec and Maya gods and their cities with exceptional accuracy; this is one of those books you can't put down. With authentic historical facts expertly woven into this spectacular action-packed fiction series, no one of any age can resist its magnetism. This is a fascinating and exciting fiction story created with expertise and finesse, which educates while entertaining the reader. The Temple of the Crystal Timekeeper by Fiona Ingram is Book 3 of The Chronicles of the Stone middle grade adventure series. Adam and Justin are back in their third adventure as they continue the hunt for the seven Stones of Power. They have teamed up again with their friend Kim Maleka, and are off on a journey to the Mexican jungle. What was supposed to be a simple reconnaissance flight takes a sinister turn as their plane crashes. James, the pilot, is hurt and, after they are all rescued by an uncontacted tribe from the jungle, Adam, Justin, and Kim head off with Tukum, a young boy from the tribe, deep into the jungle in search of a lost city. Crocodiles, predators, and their arch enemy Dr. Khalid are just some of the obstacles the kids must overcome on this perilous journey, not to mention another deadly foe, all of which results in a game of life and death. Can the kids find the stone and return from the jungle unscathed? Or will Dr. Khalid prove triumphant this time? The Temple of the Crystal Timekeeper is an excellent addition to this series. If you haven't read the first two books, do so before you attempt this one. I have read the rest of the series and found this book to be just as fascinating, perhaps more so as the intrigue and the adventure ramps up a notch. The book is well-aimed at its target audience but, as an adult, I must say that I thoroughly enjoyed it – it’s kind of like the young adult version of the Raiders of the Lost Ark series! The story continues nicely from the end of book 2 with the existing characters continuing to develop. New characters are joined seamlessly into the story as the adventure moves to the next level and the plot deepens as the kids continue their quest. This is a thoroughly enjoyable addition to the series, with very imaginative writing on the part of Fiona Ingram and, although it probably could be read as a standalone book, I really wouldn’t recommend it, only as part of the series – it will make more sense! Kids and adults alike will enjoy this and I, for one, am looking forward to book 4. The Temple of the Crystal Timekeeper is the third book in the Chronicles of the Stone middle grade series by Fiona Ingram, an excellent and delightful blend of fantasy and adventure for young readers, a story with a well-conceived plot and masterfully executed characters. Cousins Adam and Justin Sinclair are joined by Kim Maleka, a young African girl, on the arduous mission to locate the third Stone of Power. As the story opens, they wake up from a devastating plane crash in the Mexican jungle. Leaving behind their wounded adult companion, archaeologist James Kinnaird, the young heroes must follow the lead of a young boy called Tukum, navigating the dense forest in search of the lost city of stone gods. Apart from the challenges of a dangerous terrain with rivers filled with crocodiles, and other predators, they are haunted by the thought of their old adversary, Dr. Khalid, who could actually outwit them and get to the stone before them. But a greater surprise awaits them in the shape of an enemy who could bring back the ancient Aztec tradition of human sacrifice. Get ready for a breathtaking ride across a vividly accomplished setting. Readers who love the works of Rick Riordan will be enthused by this fascinating story. I was pulled in from the very beginning and couldn’t stop reading for a number of reasons. The action is intense; it begins right off the bat and it doesn’t slow down a bit. It is electrifying. Breathtaking. The characters — though young — exhibit great qualities that adult readers will love and I enjoyed the way the author weaves themes of teamwork and friendship and creativity around her astounding character development. Fiona Ingram is a mistress of the game of suspense, using subplots and timely chapter breaks to heighten the intensity of the reader’s curiosity. The prose is superb, with powerful and insightful passages sprinkled all over the story. The dialogues are beautifully written and they read naturally, and the author uses dialogues to enrich the already wonderful plot elements, deepen character, and build conflict. Readers who love works that are anchored in ancient traditions, myths and old civilizations will fall head over heels for this entry in the series. The traditions of the Maya and the Aztec are seamlessly woven into the plot. 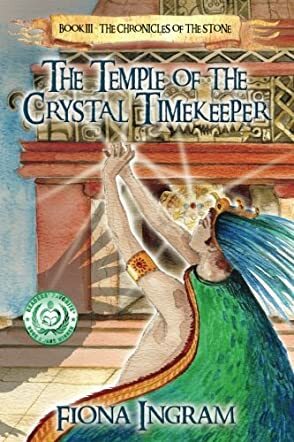 The Temple of the Crystal Timekeeper is captivating, highly entertaining, and an exhilarating ride for both young and adult readers who love fantasy and adventure. The adventure starts right away in The Temple of the Crystal Timekeeper (Book III: The Chronicles of the Stone) by Fiona Ingram. Adam, Kim, and Justin’s search for the third Stone of Power already has a rough beginning, after their plane crash landed them deep in a Mexican jungle. Their archaeologist friend, James, is seriously wounded. Unexpected help comes when an uncontacted tribe, the jaguar people, saves them and takes them to their camp. With the help of Tukum, a boy from the tribe as their guide, they must find the stone before Dr. Khalid does, and also face a scary enemy who has personified himself as an evil Aztec god. Adam learned compassion and courage in the previous quests. It's time for him to learn another important lesson. The thrilling plot and the engaging narrative are complemented well with the excellent illustrations, which deftly encapsulate the premise centering on the Maya culture and Aztec legends. In terms of character growth, Adam’s calm demeanor continues to better his reasoning skill and Kim is slightly more in sync with him. As for Justin, his impatience seems to stay the same. Then again, he provides some funny moments through his witty dialogue and antics. The Temple of the Crystal Timekeeper is a big-hearted book that will appeal to adventurers and history enthusiasts of all ages, particularly with the interesting and informative end notes provided. There’s a substantial underlying message about the preservation and appreciation of the environment, especially indigenous people’s rights, their invaluable history, and ancient heritage. This is a stellar continuation as Fiona Ingram deftly keeps the momentum going for the series.